Liz, hearts and love really sum it up! 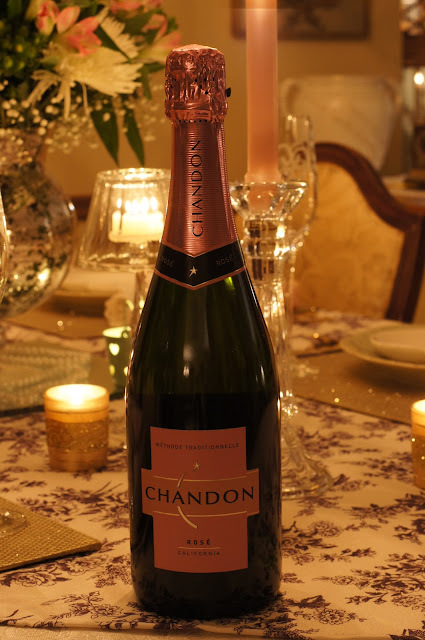 Your table is styled beautifully in every detail thoughtfully planned out. Sweet inspiration sign that inspired your color scheme and theme. How sweet to invite newly engaged friends to a romantic dinner. I know they will always remember your hospitality and kindness. 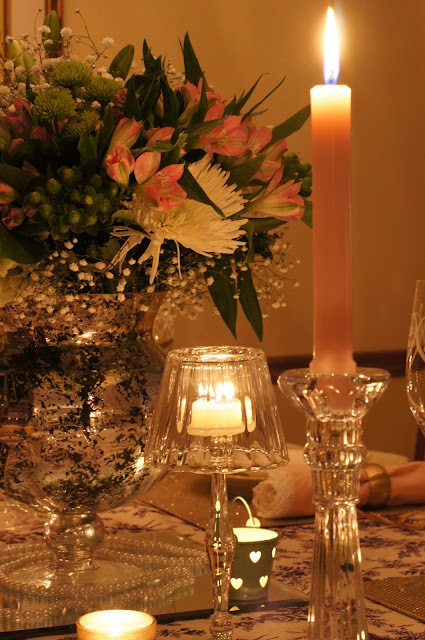 Crystal, candlelight, flowers, sparkle and lacy glasses to toast with provide a lovely ambience for a romantic hearts and love table. 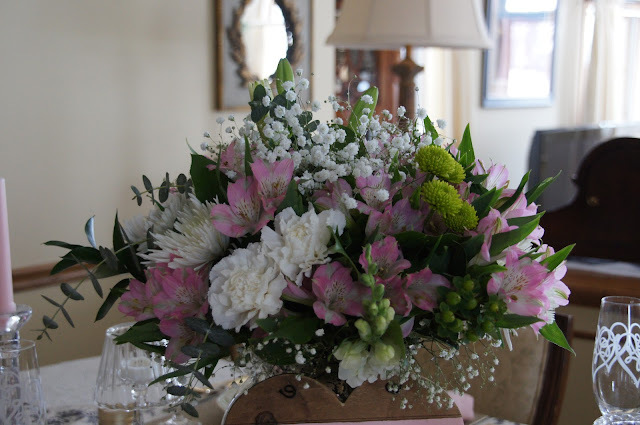 Your floral centerpiece is gorgeous! 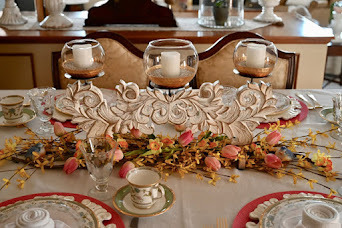 Wonderful tablescape, Liz! 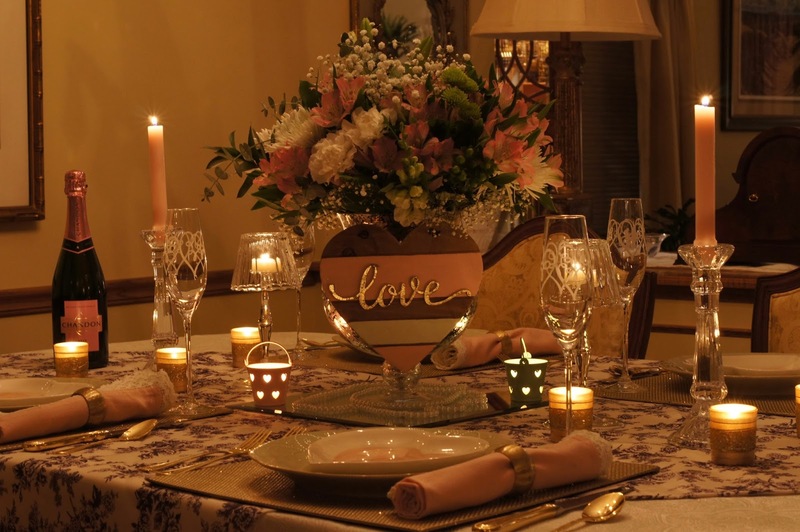 What a nice gesture to honor the engaged couple with a special dinner and setting. I absolutely love the chartreuse green of your grocery flower choices, and the ballet pink...well, it'll always be a love of mine. :) They look great in the apothecary jar. Those Lenox plates - so pretty! You did a great job of springboarding off that plaque with your table. Beautiful view into your living room, too. When I saw you were participating in this hop, I was a really happy. You've got great class and style. It's a pleasure to be in your company! Beautiful table, the soft colors just glow in the candlelight. 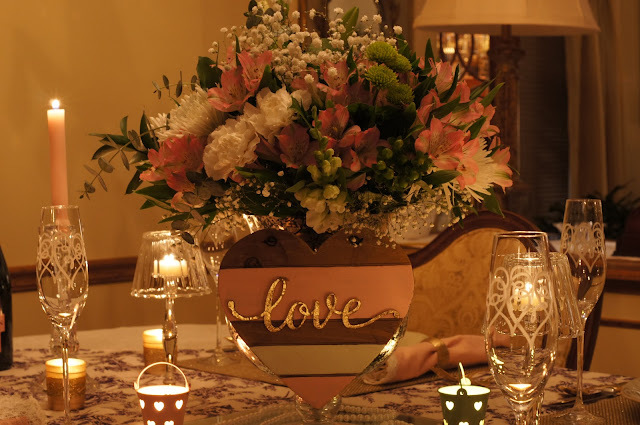 What a nice table to celebrate love especially for a newly engaged couple to share with you. Beautiful table Liz. You have such a natural artistic flair of creating ambience, beautiful décor and warmth in your all of your decorating. What a nice celebration for the engaged couple! This was such a joy to share this blog hop day with you! to see the setting you created. The sweet little tea light pails are so cute. I would never guess you sprayed them. Your Spring flowers are cheerful, bet they smell great too. Happy Valentine's Day to you and Dan & and your friends. Oh Liz, very very pretty! I think my favorite element is the stemware with hearts. How lovely! Liz, hearts and love are a perfect combination. 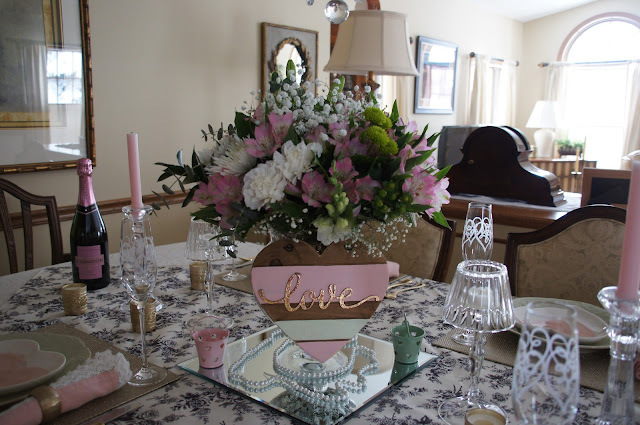 I love your beautiful table with all the special details...the centerpiece is stunning and the pink lacy napkins are so pretty. How sweet to invite a newly engaged couple to dinner on Valentine’s. 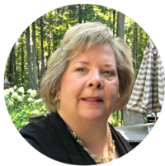 I am so thrille to be blog hopping with you this week! 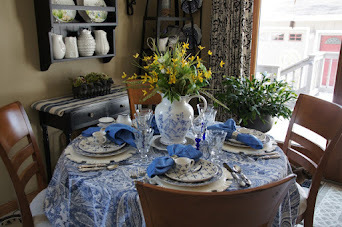 How much fun to share your pretty table with a "new found love" couple! 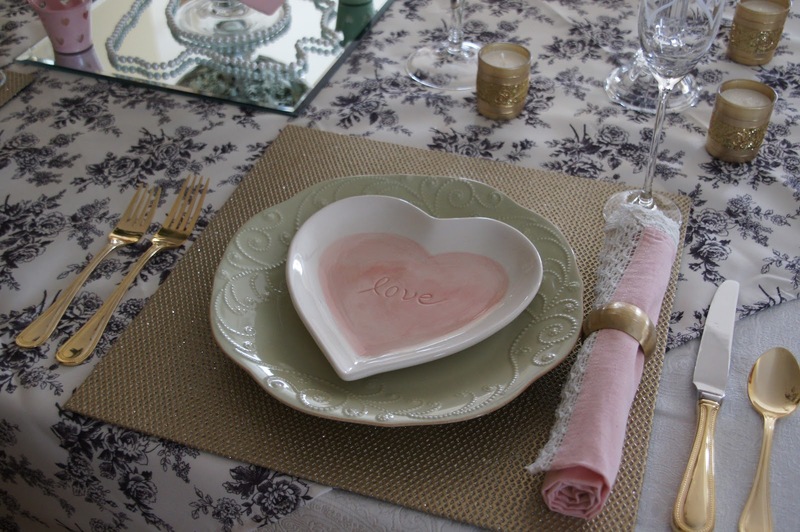 I am crazy over that wooden heart, so cute with the PB love plates! The soft pink and gold is just beautiful, and the candlelight shots are just dreamy...Beautiful Liz! Beautifully done. The color palette is gorgeous...love the sign! Sharing your table with a newly engaged couple is so sweet and romantic. The floral arrangement is gorgeous. Pink and gold are so beautiful together. You have covered all of the bases with candlelight, hearts, flowers and more. Liz, your flowers are stunning. They're so delicate, and yet so bold. Love it! 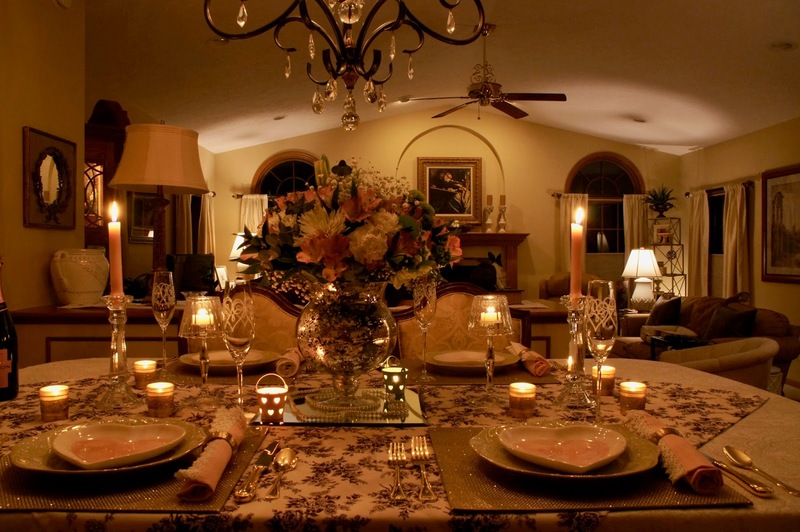 The tablescape really comes to life by candlelight at night. I hope you get to enjoy it! Happy Vday! Wow, what a lucky couple to get to dine at this table! Now you have set the bar high for their future Valentine's Day celebrations! Your fresh flowers are stunning. That heart that says love is so unique! I just love what script can do to a table. How fun for all of you! Liz, love all the tea candles on your table and pretty pink Valentine plates are so sweet. A very romantic setting. 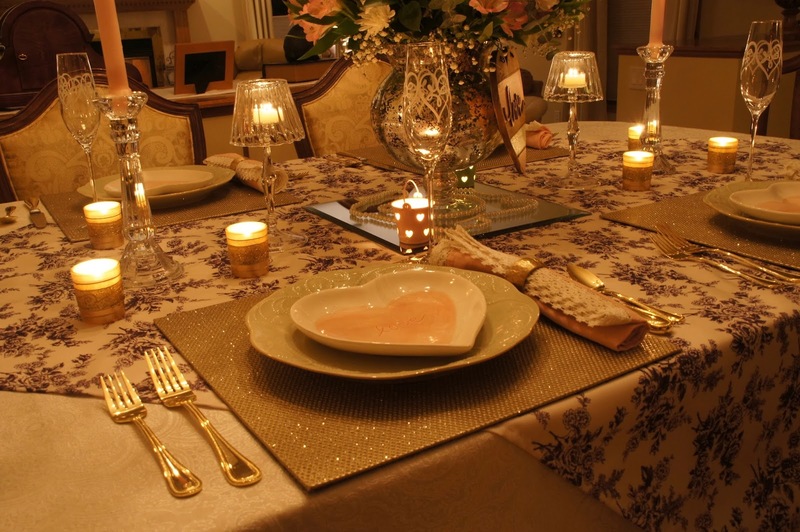 Liz, your table is beautiful and I love how it looks with everything glittering and glowing in the evening. The flowers are amazing for store bought and just shows if one takes the time to combine bouquets as you did, the results are lovely. So sweet to honor another couple also...that is what life is about, sharing the love. It is always good to table hop with you, so much inspiration. I'm sure your lovely table will put your dining friends in the mood for celebrating their engagement and romance! 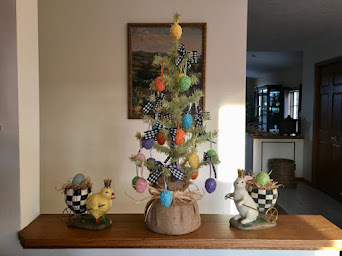 Beautifully done, Liz! Happy Valentine's Day, sweet lady! What a gorgeous Valentine's Table! 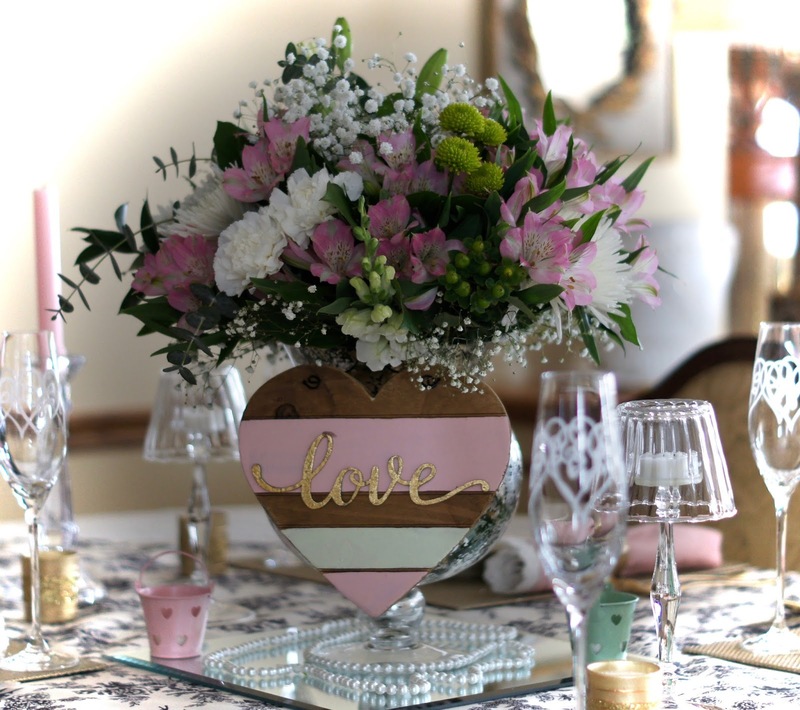 My three favorite things are the stemware, the heart plates and the centerpiece! You did a fabulous job with some supermarket flowers. 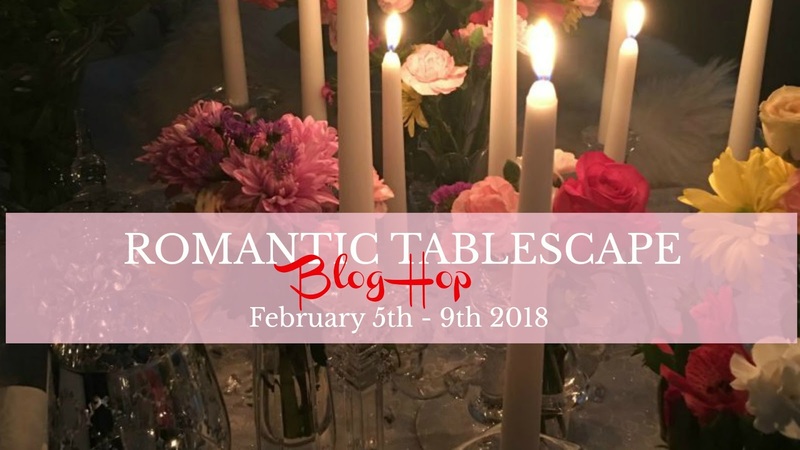 I bet the newly engaged couple will remember the Valentine's dinner they had at this very special table that exudes love and romance! Your romantic table is wonderful. Loving the placemats with the bit of sparkle. The napkins are very pretty too. I loved seeing your table transition from day to night, and it really was romantic with all the candlelight at night, which I know can be difficult to photograph. 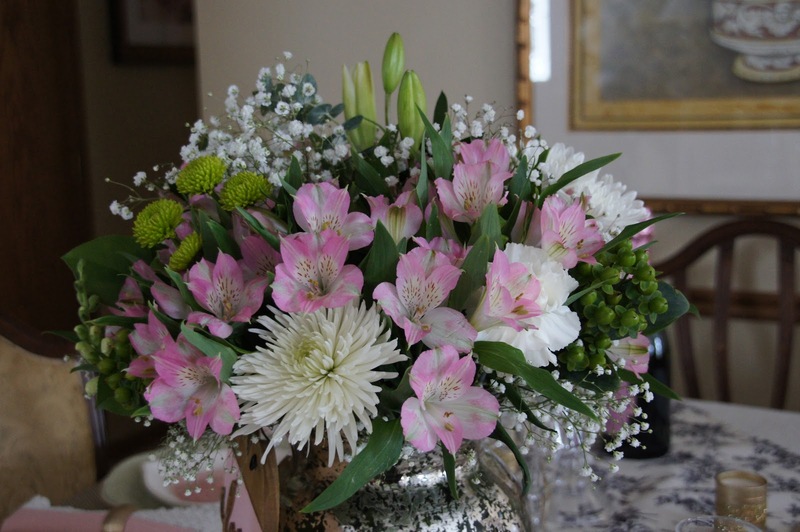 The pinks, golds, and crystal all complimented one another, and the fresh flowers were so pretty. 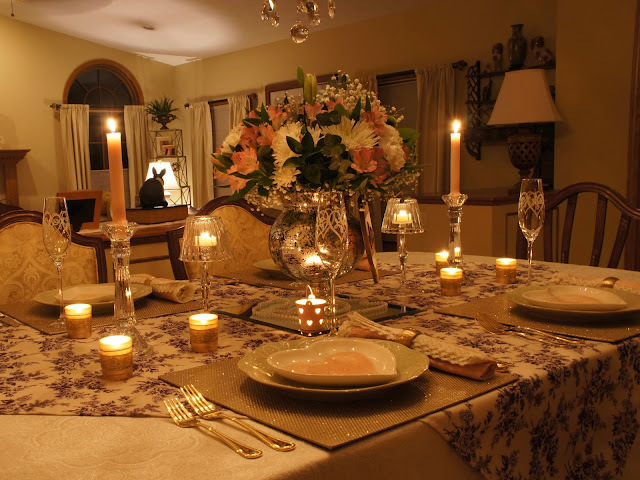 Your table is absolutely gorgeous and candlelight is especially lovely! Liz, your table is just lovely! From the beautiful floral centerpiece to the sparkling placemats, it's so romantic! 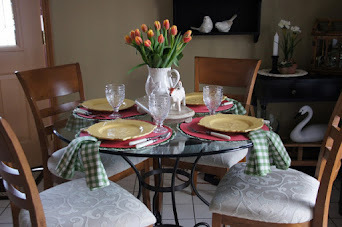 How nice of you to set a table that incorporates your friends' recent engagement as well as Valentine's. Love the soft lighting pics which really showcase the ambiance you've created. So romantic and beautiful Liz. Like I keep saying you need to put all your table settings into a book. It would be a best seller. Happy Friday. Have a great weekend. Oo la la, mon cherie! This is truly a setting for people in love! I really like the way the sign looks as if it’s actually the floral vessel! That’s cool! I also appreciate that you were able to create such a full, varied, and lush floral arrangement without breaking the bank. I think a lot of folks feel like they have to sell the rights to their first born to get flowers that look beautiful and last. You’ve certainly dispelled that myth!!! Gorgeous! How wonderful to share your beautiful table of hearts and love with the newly engaged couple! I love the soft light pink you've added, especially the bouquet of flowers, and the heart sign. Simple gorgeous, especially when all lit up at night. 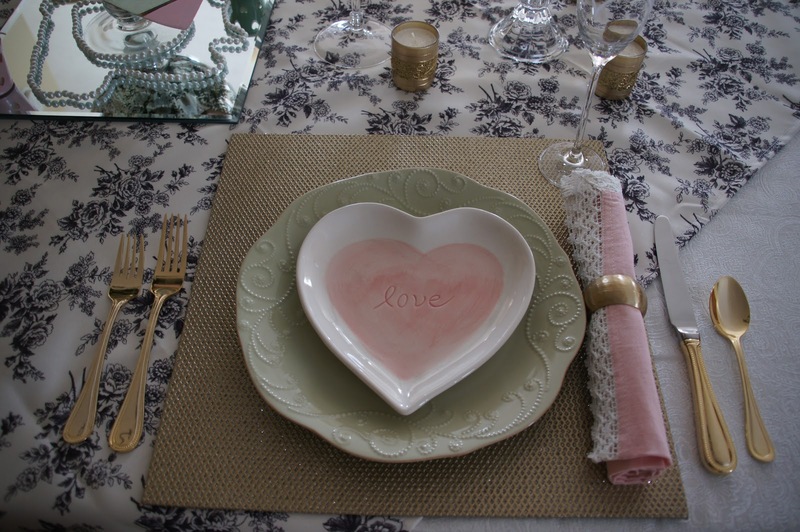 Beautiful Valentine table, love the colors and love sign. Thank you for sharing at our "Vintahe Valentine" blog hop. 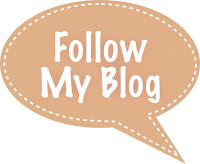 Please visit my blog again. Such a sweet and romantic tablescape! Love the color palette and the gorgeous flower arrangement! Bravo! Liz, what a perfectly romantic, elegant, and beautiful table. The candlelight photos are stunning! Your pretty flowers and heart plates are the perfect finishing touch. I hope that you have a Happy Valentine's Day!!! 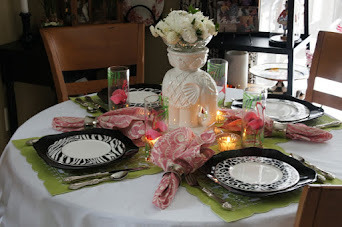 I just love your sweet romantic tablescape! The dishes are gorgeous and the flowers really complete it! What a lovely, romantic yet welcoming table. Absolutely stunning! Liz, your centrepiece is stunning. I love the mercury glass vase too! So romantic with all the candles lit! Very pretty! Aw to have fresh flowers on the table this time of year! The centerpiece was gorgeous and has me longing for spring. So happy to discover your blog. Your garden is wonderful! So pretty. Very romantic and fun to see the daytime and candlelit pictures. 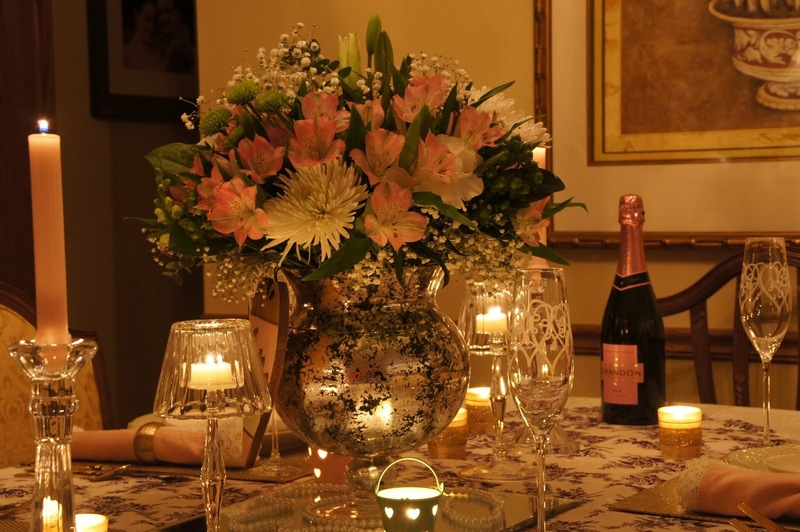 Such a romantic setting – for four! Congratulations to your friends on their engagement. They're lucky to have you to celebrate with! Beautiful setting and love that little sign!